This is a list of pies, tarts and flans. 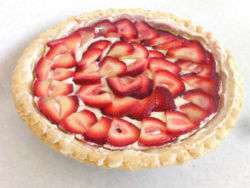 A pie is a baked dish which is usually made of a pastry dough casing that covers or completely contains a filling of various sweet or savory ingredients. A tart is a baked dish consisting of a filling over a pastry base with an open top not covered with pastry. 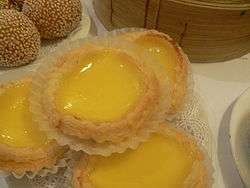 The pastry is usually shortcrust pastry; the filling may be sweet or savory, though modern tarts are usually fruit-based, sometimes with custard. Flan, in Britain, is an open pastry or sponge case containing a sweet or savory filling. 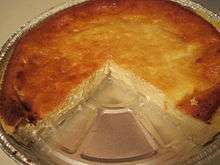 A typical flan of this sort is round, with shortcrust pastry. Aloo pie Trinidad and Tobago savory This soft and fried pastry is a variant of the samosa, made from flour and water, and filled with boiled, spiced and mashed potatoes and other vegetables like green peas. 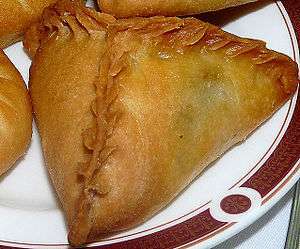 Its shape is similar to a calzone, and it is usually larger than a samosa, approximately 5 inches (13 cm) long. 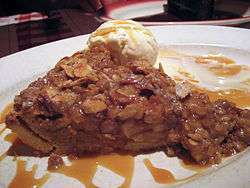 Apple crumble United States sweet A dessert consisting of baked apples topped with a crispy crust. Many different kinds of fruit can substituted for apples, and one of the most common variants is 'apple rhubarb crisp' including rhubarb. It is an easy to make and tasty alternative to apple pie and apple cobbler. 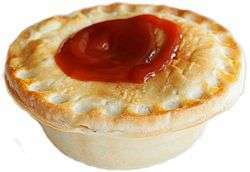 Australian and New Zealand meat pie Australia and New Zealand savory A hand-sized meat pie containing largely minced meat and gravy sometimes with onion and often consumed as a takeaway food snack. 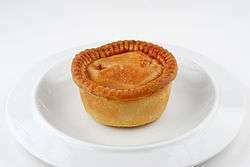 The pie itself is congruent with the United Kingdom's steak pie. Bakewell tart Great Britain sweet A tart with a shortcrust pastry shell, spread with jam and filled with a sponge-like, ground almond filling. Often covered with nuts, such as almonds and peanuts, a top layer of almond flavored icing, and a half glacé cherry. Banana cream pie United States sweet A cream pie made with a rich custard made from milk, cream, flour, and eggs and combined with sliced bananas in a pastry or graham crumb crust. It is often made with a whipped cream topping. 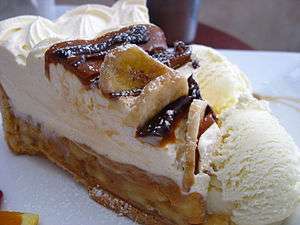 Banoffee pie Great Britain sweet An English pastry-based dessert made from bananas, toffee and cream, either on a pastry base or graham crumb crust. 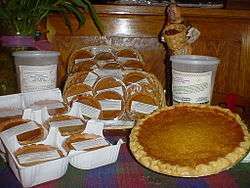 Bean pie United States sweet A sweet custard pie with a filling of mashed beans, sugar, butter, milk, and spices, including vanilla, cinnamon, and nutmeg. 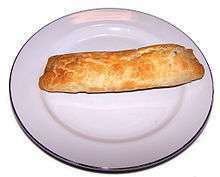 Bedfordshire clanger Bedfordshire, England, UK savory and sweet An elongated, suet crust pie with a savory filling at one end (meat, potatoes and vegetables) and a sweet filling (jam or fruit) at the other. 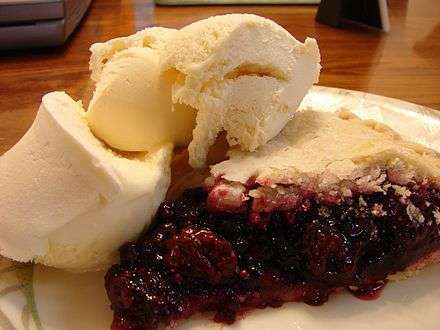 Blackberry pie United States sweet A fruit pie with a filling made from blackberries. Black bottom pie United States sweet A layer of chocolate pastry cream or pudding, the "black bottom," topped with whipped cream or meringue in a crust of variable composition. 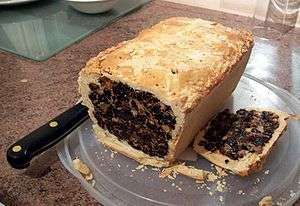 Black bun Scotland sweet A pastry-covered fruitcake, traditionally eaten on Twelfth Night. Blueberry pie New England, United States sweet A fruit pie (or tart) in which the principal filling ingredient is blueberries. Bob Andy pie United States (Amish community) sweet A sweet custard pie, spiced with cinnamon and cloves. Bougatsa Greece sweet or savory Consists of custard, cheese, or minced meat filling between layers of phyllo. Boysenberry Northeastern United States sweet Made with boysenberries, often simmered into a softer sweeter "preserve"-type gel, most frequently with a second covering crust, either lattice or with only a few cutouts. 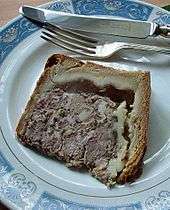 Bridie Forfar, Scotland savory A small, savory pie filled with minced steak, butter, and beef suet seasoned with salt and pepper. Sometimes with an addition of minced onions. Buko pie Philippines sweet A sweet pie originating from the Philippines. It was only available to the island country, until a method of freezing was used. 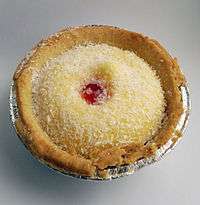 It is a very popular pie, consisting of young coconuts. Bumbleberry pie Canada, has become popular in the Midwestern United States sweet This is a sweet fruit pie in which the filling consists of blackberries, blueberries, raspberries and strawberries. Other varieties also include other berries or the addition of grapes. The color of the filling is a deep purple, and it is baked in a typical pie shell pâte sucrée. 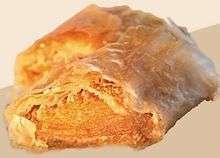 Bundevara Serbia sweet An elongated, strudel-like pie filled with sweetened pumpkin. Bündner Nusstorte Graubünden, Switzerland sweet A traditional sweet, caramelised nut-filled pastry (generally walnut). 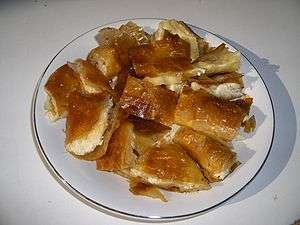 Burek Mediterranean Sea, the Slavic cuisines, throughout the Balkans and the former Ottoman Empire. savory Phyllo filled with cheese, meat, potatoes and other vegetables. Butter pie Lancashire, England, UK savory Made with sliced potatoes, onion, butter, salt and pepper in a light pastry casing. 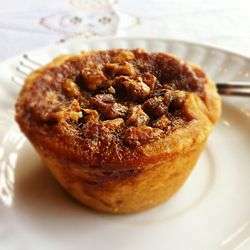 Butter tart Canada sweet Butter, sugar and eggs in a pastry shell, with raisins, pecans or walnuts often added. 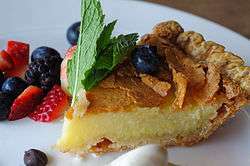 Buttermilk pie Southern United States sweet A traditional custard-like pie in a pastry crust with a filling made of a mixture of sugar, butter, eggs, buttermilk and flour. Canelé France sweet A small French pastry with a soft and tender custard center and a dark, thick caramelized crust. Cantaloupe pie Southern United States sweet A custard pie of cantaloupe, butter, eggs, and nutmeg, with meringue topping. Caramel tart Australia sweet A sweet tart, filled with soft piped caramel. 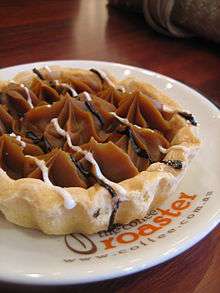 Sometimes topped with whipped cream or drizzled with chocolate. Cheesecake United States sweet Cream cheese and pastry; may come in a variety of flavors. Cheese pie United States sweet A pie with a filling similar to cheesecake with a graham wafer crust and often topped with fruit. 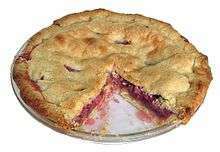 Cherry pie United States sweet A pie baked with a cherry filling. 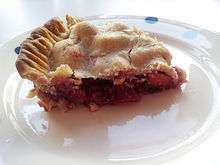 Usually made with tart rather than sweet cherries so as to control the sweetness of the pie. 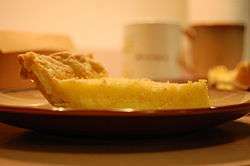 Chess pie Great Britain sweet A custard pie with a filling composed of eggs, butter, granulated sugar, brown sugar, vanilla and corn meal. Chicken and mushroom pie Great Britain savory A pie made with a pastry crust with a filling of small pieces of chicken and sliced mushrooms in a creamy sauce. 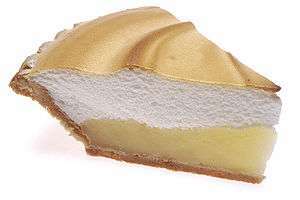 Chiffon pie United States sweet A pie with a filling made by folding meringue and/or whipped cream into a mixture resembling a fruit curd (most commonly lemon) in a crust of variable composition. Can also be made with canned pumpkin in place of the fruit. Pâté chinois Quebec, Canada savory A layered French Canadian dish similar to English cottage pie. 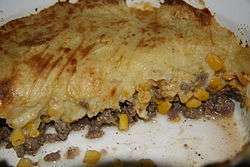 It is made with ground beef and sautéed onions on the bottom layer, canned corn (whole-kernel or creamed) for the middle layer, and mashed potatoes on top. Cookie Cake Pie United States sweet A combination of cookie dough and cake batter baked together in a pie crust. Corned beef pie Great Britain savory A pie with a filling of corned beef, onion and other vegetables such as corn, peas or carrot. 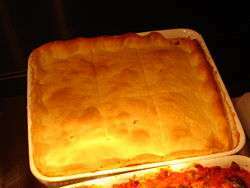 The pie can be made with a mashed potato topping, as in cottage pie, or with a traditional pastry crust. 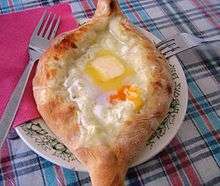 Coulibiac Russia savory A baked pie with a filling made with salmon or sturgeon, rice, hard-boiled eggs, mushrooms, and dill. 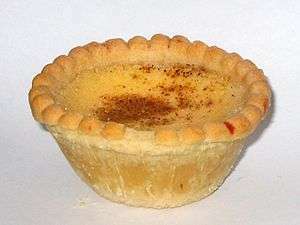 Custard tart France, Great Britain sweet A baked pastry consisting of an pastry crust filled with egg custard. 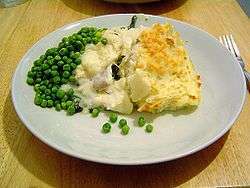 Fisherman's Pie Great Britain savory A dish made with white fish in a béchamel sauce with a mashed potato topping, similar to cottage pie. 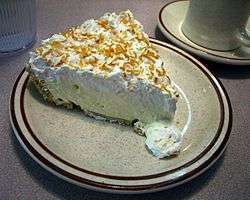 Flapper pie Western Canada sweet A custard pie with a graham wafer crust, topped with meringue. Fleischkuekle Russia, Germany, North Dakota, United States savory A fried meat pie made with flat bread. Flipper pie Eastern Canada savory A meat pie made from young harp seal flippers. Green grape pie Southern United States sweet Traditionally made with wild green grapes before seeds have formed in the spring, such as early May. Homity pie Great Britain savory A traditional British, open vegetable pie. 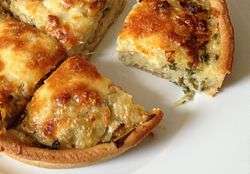 The pastry crust contains a filling of potatoes and an onion and leek mixture, which is then covered with cheese. Hornazo Spain savory A Spanish meat pie made with flour and yeast and stuffed with pork loin, spicy chorizo sausage and hard-boiled eggs. 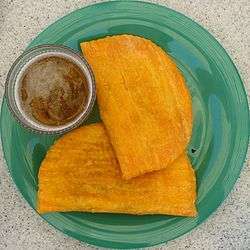 Jamaican patty Jamaica, Caribbean savory A small, baked pastry usually filled with seasoned ground beef. 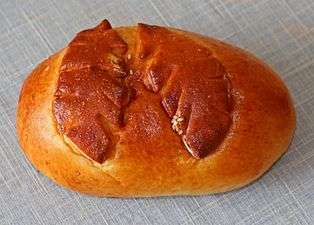 Kalakukko Finland Savory A loaf of bread filled with fish. 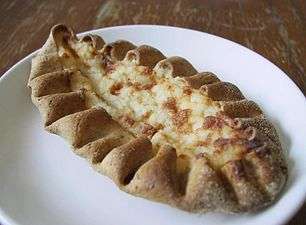 Karelian pasties Finland Savory Pasties made from a thin rye crust usually with a filling of rice, but originally the filling used to be mashed potatoes or barley. Meat and potato pie Yorkshire, Lancashire, and Cumbria regions in the United Kingdom savory Potato, either lamb or beef, and sometimes carrot and/or onion baked in a pastry shell. 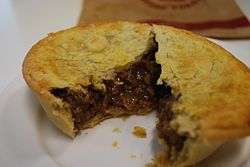 Meat pie Popular in Europe, Australia, New Zealand, Canada, and South Africa savory A preparation common especially to the UK and Commonwealth countries. Originally a way to stretch ingredients when quantities were not enough for a single meal. Usually made with a hot water crust. Mince pie United Kingdom sweet A small British sweet pie traditionally served during the Christmas season; a sweet pastry case filled with currants, suet and spices. Centuries ago they contained meat, suet and spices. Echpochmak Russia savory A triangular pastry, filled with minced beef, onion and potatoes. Considered a Tartar national dish. Pastafrola Argentina, Uruguay, Paraguay, Greece sweet A jam-filled tart with shortcrust pastry lattice. Fillings may include quince cheese, dulce de batata (sweet potato jam), dulce de leche, guava, or strawberry jam. Pasty Cornwall, United Kingdom, Canada savory A traditional lunch food for Cornish miners. The rolled part of the crust was used as a handle and left uneaten where it was soiled with arsenic-laden ore from the miner's hand. 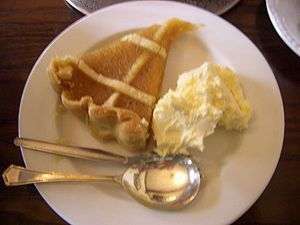 Peach pie United States sweet Prepared with peaches as the primary ingredient, with added spices such as nutmeg, ginger or cinnamon. May be strictly a fruit pie, or a custard based pie. Because peaches are a high moisture fruit and produce copious amounts of juice as they cook, peach pies often have a lattice top to allow steam to vent and prevent excessive liquid build-up during baking, which could result in a runny pie. Pecan pie United States sweet A pie made primarily of corn syrup or molasses and pecan nuts in a pie shell. Pirog Russia, Ukraine savory or sweet Generic term for pies and pasties in Eastern-Slavic cuisines. 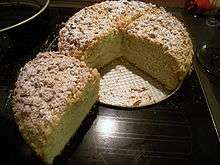 The filling for pirog may be sweet and contain quark or cottage cheese, fruits like apples, plums or various berries, as well as honey, nuts or poppy seeds. 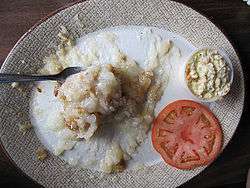 Savory versions may consist of meat, fish, mushrooms, cabbage, rice, buckwheat groats or potato. pirozhok, piroshki Russia, Ukraine savory or sweet Generic word for individual-sized baked or fried buns (small pirogs) stuffed with a variety of fillings. 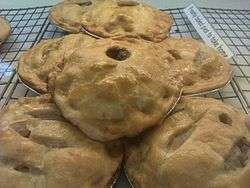 Pork pie Britain savory A traditional British meat pie consisting of roughly chopped pork and pork jelly sealed in a hot water crust pastry. 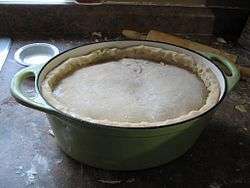 Pot pie United States savory A savory pie made from pastry crust, usually served in individual containers. Normally made of a creamy sauce, turkey or chicken meat, carrots, peas, and pearl onions. This dish is sometimes served with rice. 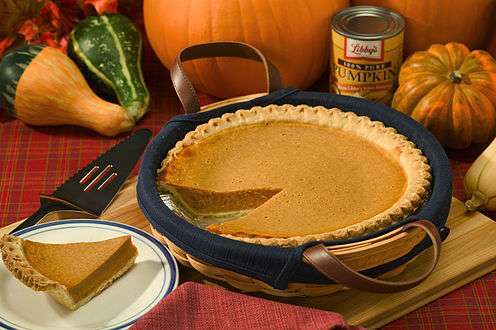 Pumpkin pie United States sweet Pumpkin-based custard flavored with nutmeg, cinnamon, cloves, and ginger, baked in a single pie shell. 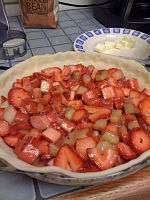 Sometimes the crust is a graham cracker crust or a pastry dough crust. Very common in the autumn and early winter holidays. 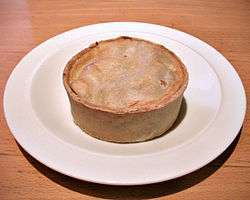 Scotch pie Scotland savory A small, double-crust meat pie filled with minced mutton or other meat. 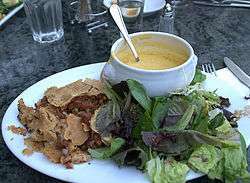 Cipaille United Kingdom savory A layered meat pie made with meat or fish, and is known to have been served to British sailors during the 18th century. Sfiha Levant savory Open-faced meat pie made with ground mutton. Shepherd's Pie United Kingdom savory Roasted mutton or lamb cooked in pie dish lined with mashed potato, with a mashed potato crust on top. 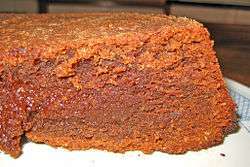 Shoofly pie United States sweet A molasses pie common to Pennsylvania and the Delaware Valley. 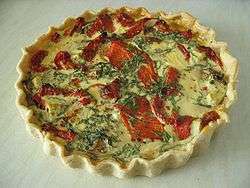 Southern tomato pie Southern United States savory A a savory dish consisting of a pie shell with a filling of tomatoes (sometimes with basil or other herbs), covered with a topping of grated cheese mixed with either mayonnaise or a white sauce. 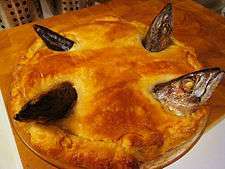 Stargazy pie United Kingdom savory A Cornish dish made of baked pilchards, along with eggs and potatoes, covered with a pastry crust; the fish heads (and sometimes tails) are baked protruding through the crust, thus appearing to be gazing skyward. Steak and kidney pie Britain savory Pie filled with a mixture of diced beef, diced kidney (often of ox, lamb, or pork), fried onion, and brown gravy. Steak pie United Kingdom savory Meat pie made from stewing steak and beef gravy, enclosed in a pastry shell. 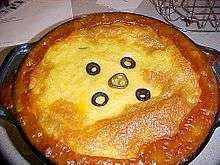 Tamale pie Southwestern United States savory A meat pie with a cornmeal crust and typical tamale fillings arranged in several layers. The meat is traditionally ground beef. 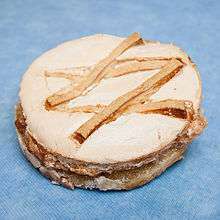 Tarta de Santiago Spain sweet A cake or pie with a filling of ground almonds, eggs and sugar. 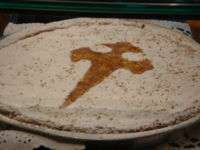 The top of the pie is usually decorated with powdered sugar, masked by an imprint of the Cross of Saint James (cruz de Santiago) which gives the pastry its name. 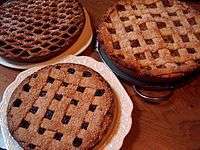 Vlaai Netherlands sweet A pie or tart consisting of a pastry and a filling of either fruit, a crumbled butter and sugar mix, or a cooked rice and custard porridge. 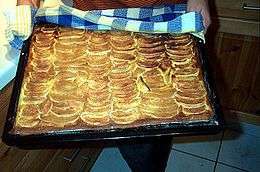 Wähe Switzerland savory or sweet Flat cake prepared with short pastry and a topping of either fruits, vegetables or cheese. 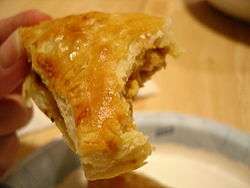 ↑ Aloo Pie (Trinidad) Accessed February 6, 2008. ↑ Phillips, Jock (13 July 2012). "Bicultural New Zealand". The New Zealanders. Te Ara: the Encyclopedia of New Zealand. Ministry for Culture and Heritage (New Zealand). Archived from the original on 2014-07-24. ↑ Jung, Susan. "Affair of the tart". SCMP. South China Morning Post. Retrieved 8 April 2014. ↑ pastaflora (Spanish). Diccionario de la lengua española (22.ª edición), Real Academia Española (2001). ↑ Deen, Paula. "Tomato Pie Recipe". Food Network. Retrieved 24 November 2015. ↑ Crain, Eula (2011). Best of the Best, from Southern Coastal Ladies. PublishAmerica. ISBN 9781456085827. Retrieved November 24, 2015. ↑ "Früchtewähen / Gâteaux aux fruits / Torte di frutta". In the data base of Culinary Heritage of Switzerland. ↑ "Woolton pie creator dies", The Times, London, 17 August 1966, p.1.